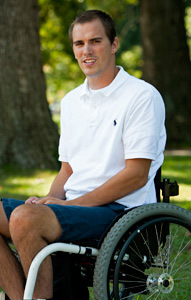 Ryan Beale ’13 still likes to tell the lacrosse team to “Get tough,” though he has had to get tough in a whole new way. 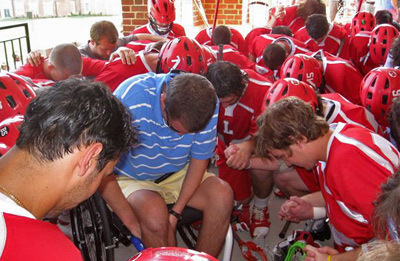 Ryan now offers the lacrosse team encouragement from a wheelchair, after an automobile crash his junior year left him paralyzed from the chest down. The wreck occurred Oct. 17, 2009 while he was at home in Suffolk, Va., for fall break. Ryan made it back to LC in January 2011, after months of determination-filled rehabilitation. He is back majoring in environmental science with a minor in math. He makes it to every lacrosse practice to pass on advice to defenders and help Coach Steve Koudelka keep an eye on things. Mostly, though, he and the team members provide support for each other. “I know at least 55 people if I need something,” Ryan says. Fiercely independent, Ryan tries not to ask for help, and doesn’t want people to feel sorry for him. He has figured out how to open doors, even when handicapped access buttons don’t work, and how to drive a vehicle with his hands. His truck gets him around campus. “I didn’t realize how many hills there were,” Ryan said. Ryan has made many adjustments since his accident. He went through seven months of rehabilitation at the Shepherd Center in Atlanta, one of the top rehabilitation hospitals in the nation for people with spinal cord injury or brain injury. After his accident, Ryan lost 60 pounds and was very weak. “I couldn’t even lift a one-pound dumbbell,” he said, adding that Coach Koudelka likes to joke that he really couldn’t lift much before his accident. A sense of humor keeps Ryan going. Ryan also inspired his team when he traveled to Hampden-Sydney College in spring 2010 to see them play. He was also there for his best friend from high school, Kyle Jett, who played for Hampden-Sydney. Upon his return to campus in January, Koudelka said Ryan found a lot of support, not just from teammates, but from professors, the Residence Life staff, and others. Ryan is glad to be back and finds some unexpected bright spots in his new position. He gets to skip class when elevators are out of service and gets to park in handicapped spaces. On the truly positive side, Ryan said he has met some great people through his experience. His girlfriend before the accident remains his girlfriend. And he has some ideas about future employment; he would like to travel to test buildings for ADA (American with Disabilities Act) accessibility. “It’s given me a whole new perspective on life,” he said. Persons needing accommodations for disabilities at a University of Lynchburg event should contact the Center for Accessibility and Disability Resources at least one week before the event. Email timmons.j@lynchburg.edu or dillon_ma@lynchburg.edu, or call 434-544-8339.